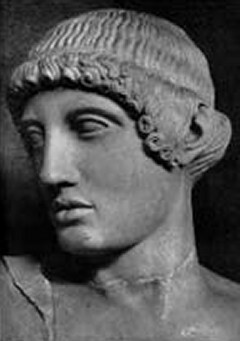 Gorgias (c. 487 - 376 B.C.) was a Pre-Socratic Greek philosopher, orator and rhetorician from Sicily. Along with Protagoras, he was one of the major figures in the first generation of Sophists. Both Plato and Aristotle criticized Gorgias severely, labeling him as a mere sophist (in the derogatory sense of "sophistry") whose primary goal was to make money by appearing wise and clever, and not a true philosopher. However, he was undeniably highly influential and, in bringing his rhetorical innovations from his native Sicily to Athens and Attica, he also contributed to the diffusion of the Attic dialect as the language of literary prose. Gorgias (pronounced GOR-jas) was born around 487 B.C. (or possibly 483 B.C.) in Leontini, a Greek colony in Sicily. His father was named Charmantides, and he had at least two siblings, a brother named Herodicus and a (unnamed) sister. In his youth, he may have been a pupil of Empedocles, although he would only have been a few years younger. He was familiar with the works of Zeno of Elea and used his paradoxes (especially the so-called "arguments against motion") in his own work. He was already about sixty when he was sent in 427 B.C. to Athens by his fellow-citizens at the head of an embassy to ask for Athenian protection against the aggression of the neighboring Syracusans. On completing his mission, he subsequently settled in Athens, probably due to the enormous popularity of his style of oratory and the profits he could make from his performances and rhetoric classes. Like other Sophists, he was an itinerant, practicing in various cities and giving public exhibitions of his rhetorical skill at the great pan-Hellenic centers of Olympia and Delphi (including inviting questions from the audience and giving impromptu replies), and charged substantial fees for his instruction and performances. His florid, rhyming style seemed to almost hypnotize his audiences, and his powers of persuasion were legendary. Among his distinguished students in Athens were Isocrates (436 - 338 B.C., one of the greatest and most influential orators of his time), Critias (460 - 403 B.C., a leading member of the so-called Thirty Tyrants of Athens), Alcibiades (c. 450 - 404 B.C., a prominent Athenian statesman, orator and general), Thucydides (c. 460 - 395 B.C., an important historian), Agathon (c. 448 - 400 B.C., a popular tragic poet) and Pericles (c. 495 - 429 B.C., a prominent and influential statesman, orator and general of Athens). Gorgias transplanted rhetoric from his native Sicily to Athens and Attica, and in the process contributed to the diffusion of the Attic dialect as the language of literary prose. He ushered in rhetorical innovations involving structure and ornamentation and the introduction of paradoxes and paradoxical expression, for which he has been labeled the "father of sophistry". His rhetorical works (including the "Encomium of Helen", "Defence of Palamedes" and "Epitaphios") come down to us via a work entitled "Technai", a manual of rhetorical instruction. Unlike other Sophists like Protagoras, Gorgias did not profess to teach arete (or virtue), believing that there was no absolute form of virtue but that it was relative to each situation. He believed that rhetoric was the king of all other sciences, since it was capable of persuading any course of action. Thus, much of the debate over the nature and value of rhetoric, began with Gorgias. Plato (one of Gorgias� greatest critics) was speaking in direct opposition to Gorgias, when he argued that rhetoric gives the ignorant the power to seem more knowledgeable than an expert to a group, and that Gorgias was merely an orator who entertains his audience with his eloquent words while believing that it is unnecessary to learn the truth about actual matters. A lost work, "On Nature" or "On Non-Existence", was one of Gorgias few essays into Metaphysics. It is available to us only in paraphrases from Sextus Empiricus (2nd or 3rd Century A.D.) and others, and it is generally skeptical in outlook, intended both as a refutation and as a parody of the Eleatic School, and particularly of Parmenides. It is usually presented as a three-point argument: 1) nothing exists; 2) even if something exists, nothing can be known about it; and 3) even if something can be known about it, knowledge about it can't be communicated to others. His point was to prove that it is just as easy to demonstrate that being is one, unchanging and timeless as it is to prove that being has no existence at all.